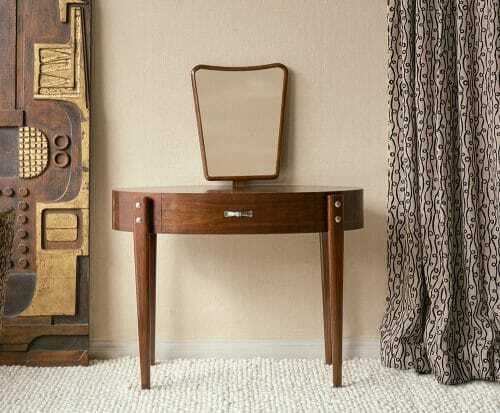 The Daphne Dressing Table is inspired by 1960s Italian design and hand made in England. 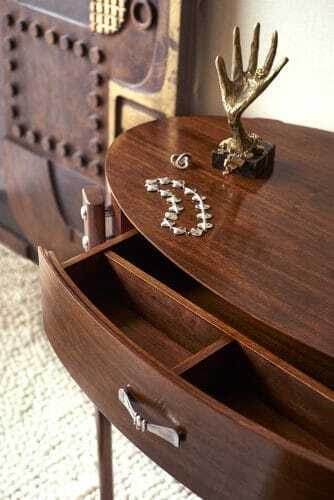 Shown here in French polished American black walnut with antiqued silver finish bow handle and button detail. Custom made by our team of skilled craftsmen in Sussex, the Daphne Dressing Table has a lead time of 8 – 10 weeks. 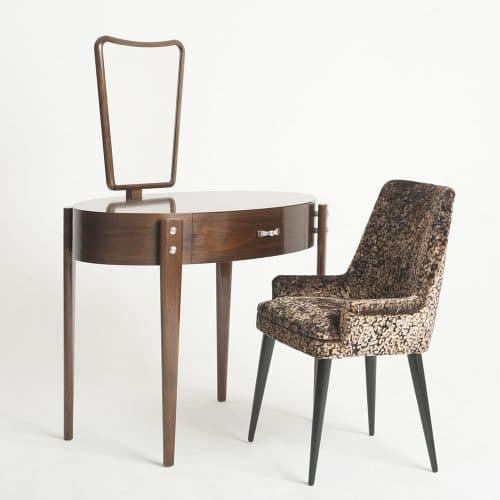 Please email us, or call the shop if you would like any further information regarding the Daphne Dressing Table +44 (0)20 7731 3234. Inspired by 1960s Italian design, handmade in England. Shown here in French polished American black walnut with antiqued silver finish bow handle and button detail. An optional glass table top is available. Mirror angle adjustable with 3 set positions. 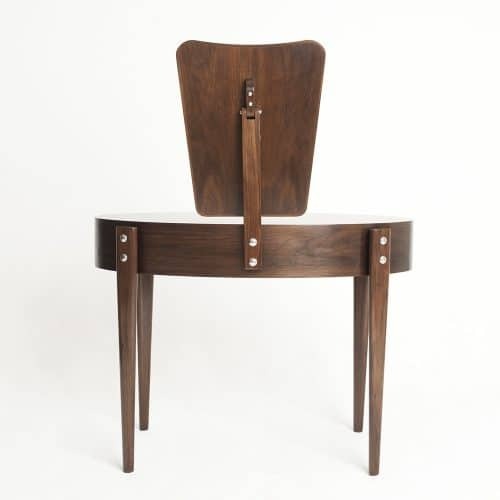 As with all our pieces from Fiona McDonald Makes custom sizes, alternative timbers and finishes are available. Lead time 8 – 10 weeks. Height including mirror 127cm. 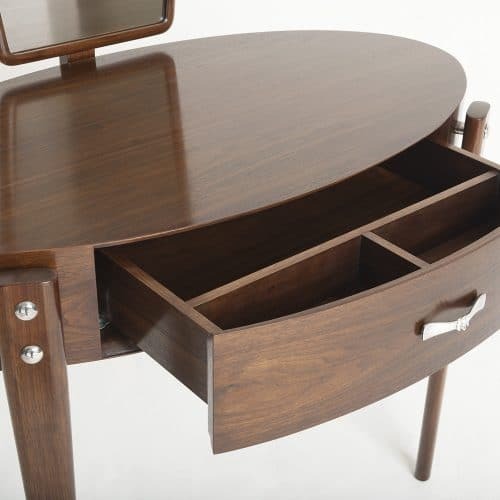 Please call the shop if you would like to discuss orders and specifications for the Daphne Dressing Table on +44 (0)20 7731 3234. 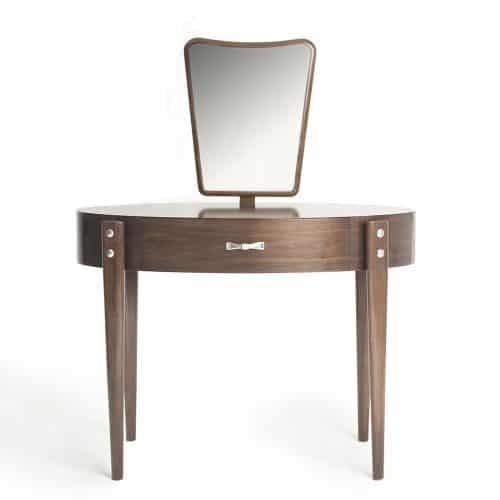 The dimensions of the Daphne Dressing Table shown here is H75 W100 D55 cm and the prices start from £5,970.